Hi everyone, have been following this forum for awhile now and am having a hard time making a choice on a jointer. I cant decide between a new Ridgid 6” ,new Grizzly 6” with knock down stand or a used Delta DJ-15 asking price 495$. This is my first jointer and i will be using it to make long glue up joints about 6’ max. Any thoughts would be so amazing as I have been dwelling on the decision for weeks! My first Grizzly tool was a G0490 jointer and I like it really well – it did much toward turning me into a fan of Grizzly equipment. I usually like to see things in person and to go through it physically before buying, which is one of the reasons I hadn’t really done much in the Grizzly aspect before (the lack of machines to view in my area), but after having a chance to use it and experience the overall quality and build, I am quite satisfied. I also found the G0490 on Facebook Marketplace for $750 and have since purchased a Grizzly G0548Z Dust Collector for $200 there, and while I generally prefer to purchase new, these two buys have given me a favorable of buying new when the machine and the price are right. 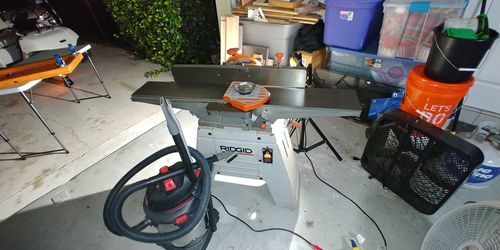 My only Ridgid tool is their oscillating spindle / belt sander and I have been satisfied with its design, build and quality. I don’t have any experience with Delta but they seem to be a staple in woodworking that goes back a ways. With a quick look through each of the three machines you have listed, I would give the edge to the Grizzly, but that is just my opinion and I don’t have any actual direct experience with any of the three jointers. I’d go after the Dj 15. Since first jointer… I would skip all 3 and look elsewhere for a $150-$200 Craigslist jointer. You will eventually go for a 8” after a number of years. Or maybe not. But 6” jointers are dime a dozen and I can find good ones locally for $200, not $500 used. I have had Grizzly tools since 1988, and have never had a major problem. I don’t know anything about the Rigid but a lot of people use them. Unless you are willing to spend some quality time with Delta, which would make it a fine machine, you should stay away from that one. I just bought a 6” jointer with 66” bed, because my grizzly became too short for jointing long boards. I would lean toward that delta if it indeed has 5’ table. See if they will “let it go” for more like $400. If you’re going to flatten rough lumber you’ll be happier with an 8” machine. You can pick up a nice used 8” jointer for about $500. Just saw an older 8” Powermatic for $500 on Orlando Craigslist. Just curious Phil what does your photo represent. I own the same Rigid jointer (albeit the older model). I am also a new woodworker, and I love the machine. Prefoms very well, set up is pretty intuitive, but knife changes are MUCH easier witha jig – although that’s most any jointer I’ve found with the exception of the spiral heads. Surely any would suit you well. Only reason I ended up with mine was a good deal on the FB marketplace. The longer table does make a difference. I’m saving my money for the Grizzly G0656, 8”x72” with the 5” fence. If you can get the Delta for $400, if it’s a 5’ table. You can always upgrade it later. Most of the time somebody selling a used item will set a higher starter price knowing they’ll most likely be negotiated down. My first Grizzly tool was a G0490 jointer and I like it really well – it did much toward turning me into a fan of Grizzly equipment. I usually like to see things in person and to go through it physically before buying, which is one of the reasons I hadn t really done much in the Grizzly aspect before (the lack of machines to view in my area), but after having a chance to use it and experience the overall quality and build, I am quite satisfied. I don t have any experience with Delta but they seem to be a staple in woodworking that goes back a ways. With a quick look through each of the three machines you have listed, I would give the edge to the Grizzly, but that is just my opinion and I don t have any actual direct experience with any of the three jointers. Thanks for the very informative reply! I was leaning towards the Grizzly. I like that it comes with casters to roll it around. I am with you, I need to be able to see it in person before I buy. Do you carve on the other side? What it looks like to me are battens or cradles to prevent wood movement. I am actually making something similar for oil painting! 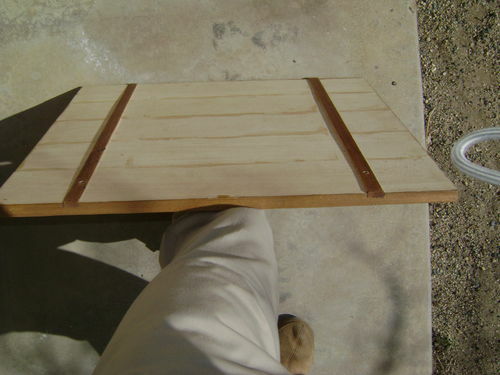 Thats the traditional way of making panels and the battens help prevent cupping.